The Houston area storm water drainage system directs street water and debris into curb catch basins that route the runoff through an underground system that empties into the city’s bayous. Discarded soda cans, plastic bags, Styrofoam cups and other pieces of floating litter from the streets enter into the drainage system. After a rainstorm, a tidal wave of trash flows into the Turning Basin on its way to Galveston Bay, the largest estuary on the Texas coast and part of the National Estuary Program. As the water level recedes to normal in the bayou, trash is left in the water and along the bayou’s banks, trapped in trees and other vegetation. This recurring presence of trash, debris and pollutants degrades water quality and negatively impacts the ecosystem. In addition, the appearance of litter results in a less appealing recreational amenity for residents and visitors to enjoy and affects Houston’s overall image. To advance its mission of revitalizing Buffalo Bayou, Buffalo Bayou Partnership initiated a clean-up program in 2002. Thanks to ongoing partnerships with Harris County Flood Control and Port Houston, BBP continues to operate a comprehensive maintenance and management program that utilizes hundreds of community service workers to collect and remove trash and debris from Buffalo Bayou and its tributaries—preventing it from flowing into Port Houston and on to Galveston Bay. Five days a week, BBP’s Field Operations staff directs and works alongside land-based crews of community service workers that collect litter and debris from the banks of the waterway. Water-borne crews work from boats to clean storm drains, banks and other natural collection areas. Collection booms are placed not only on Buffalo Bayou, but along neighboring bayous with BBP removing trash and debris along Brays Bayou up to the Gus Wortham Park Golf Course. 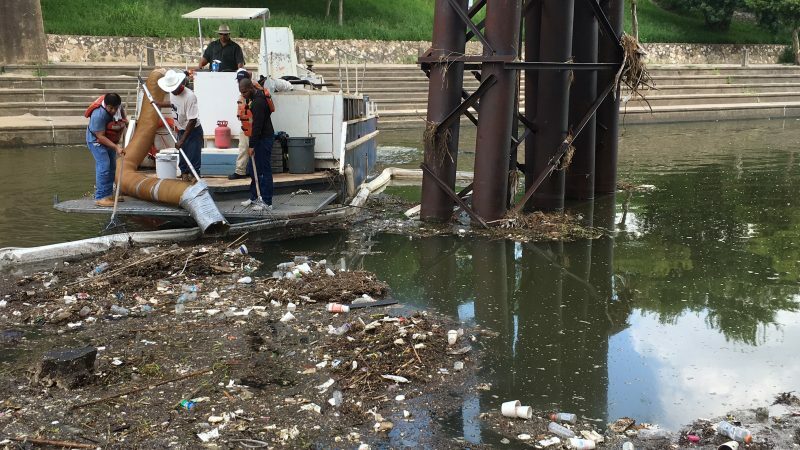 Also integral to Buffalo Bayou Partnership’s clean-up operation is the custom-built Bio-Vac, an industrial strength vessel that vacuums floatable trash from Buffalo Bayou. In 2017, close to 1,500 cubic yards of trash and debris were removed from the waterway. Buffalo Bayou was severely impacted by Hurricane Harvey, and BBP’s Field Operations team played a key role in recovery, collecting tremendous amounts of trash and debris, removing fallen trees and shrubs, and collecting thousands of plastic bags. Check out this CW39 Houston interview with BBP’s David Rivers on what happens to trash that ends up in Buffalo Bayou. Galveston Bay is Texas’ largest estuary—a coastal body of water with a free connection with the open sea—and it starts in your backyard. Check out the Galveston Bay Report Card and learn more about what you can do for a straight “A” Bay!